After spending most of the week worrying about a cold and snowy Halloween, we were once again blessed with a beautiful, albeit windy, day. Maggie's Halloween celebrating actually began on Thursday with a party at preschool and she came home with a bag full of goodies. Grandma Bonnie & Grandpa Mike came for the weekend and arrived Thursday evening, so Maggie was able to spend all day Friday with them. This also afforded Rocky and I the opportunity to attend a Guitar Hero party at some friends from church's home. 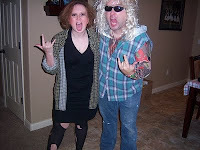 We dressed as punk rockers and had loads of fun and stayed out way past our bedtime! One of the benefits of having a free babysitter!! We had forgotten our camera (actually brought it but left it in the car and forgot we brought it) so will have to pilfer more photos from those who were there that had cameras. Maggie decided several weeks ago that she wanted to be a nice witch for Halloween and Rocky helped her find a costume at Toys R Us. 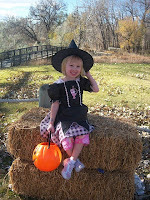 She has enjoyed playing with the costume since then!! 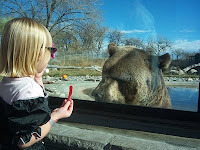 We went to Boo at the Zoo. We got there right as it was starting and missed the massive line. We got candy from a few tents and then walked over to see what Bruno was up to. We got there just as the keeper was going to start an "enrichment" so we hung around to check it out. She put out some fruit and meat and then let Bruno out to check it out. Maggie really enjoyed it when Bruno came right up to the window and she got a personal encounter with him, watching him eat some cherries. 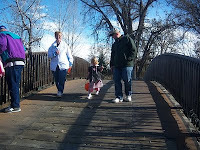 We had lunch and then headed home to relax a little before heading out trick or treating in the neighborhood. Maggie was very excited to go, but once we got out there, she decided she didn't want to go very long. We hit 5 houses when she said she wanted to go back to her house. And now, she is playing with Grandpa Mike, we are watching the Oregon football game (current score 3-3) and waiting for trick or treaters to come to our house. You and Rocky need to make that pic of the two of you into a Christmas card, I think!!! It's fabulous!! !